China is more innovative than most people think. Europe is over-regulated while China is one large experimentation group for new companies, technologies and innovations. One of those areas of interest is digital technology, in particular digital payment. Despite – or because? – a centrally led economy, entrepreneurs are the digital innovators. We have seen nothing yet: Malong Tech’s artificial intelligence, Lens Technology’s leading thin glass, Mobike’s bike sharing, Hikvision’s global market leadership in security technology and Zongmu Tech’s technology for autonomous driving. The list is long and expanding. What can western leaders learn from the way Chinese companies are organized and structured? For a Spanish speaking readership, I wrote an article on how as large organizations with strong top-down leadership and fast execution, Chinese companies are at the same time highly innovative and adaptive to changing markets through swift project execution. The cases of Xiaomi, Alibaba and Haier illustrate how these Chinese companies organize and expand their businesses. In a new research project, we are exploring novel ways of organizing for uncertainty and complexity. European companies need to act fast to define the best strategies to connect, partner or compete against Chinese players. Often unnoticed by business leaders in Europe, Chinese technology companies are on the move. Hardly a week goes by without news that Alibaba has acquired a company in Southeast Asia, Tencent has invested in an Israeli startup or that Baidu is entering a new industry. Western onlookers may think that this is unlikely to have a direct impact on their businesses. And if they are concerned or interested, often the deals are more complex and opaque than first imagined. But, there are three important reasons why the rise of digital China cannot be ignored: the scale and speed of Chinese tech investments in Europe; the unique Chinese approach to organization; and the innovation imperative for Chinese companies leveraging a comparative advantage in technology rather than cost. Young people in big cities seeking emotional outlets by embracing loneliness and consuming loneliness. A new type of Chinese consumer: well-educated, young and willing to spend – but spending alone. The empty nest youth is an emerging theme in China’s economy. Mini karaoke booths, one-pot hotpot restaurants and many mobile games to accompany the lonely. We may see a phenomenon, facilitated by technology, where young Chinese people, especially millennials, are looking for individual experiences and personalized services more than the previous generation; not unlike their peers in other countries. However, I’d argue that technology is facilitating loneliness rather than allowing Chinese consumers to embrace it. There is plenty of evidence that youngsters would rather spend time on their smartphones than on playing with friends, dating, working and just hanging around. The slightly addictive nature of certain social networks and the fact that a handful of technology giants control those information streams does make me worry about the long-term societal effects. Can China’s poorest province achieve its dream of becoming the next big data hub? Guizhou and its capital were put on the fast track to economic growth in 2013; growing over 10% in 2017. Big data is one of the focus areas for this once poorest province of China. Big data and artificial intelligence are considered as the technology to shape the future and thus make China the leading technology power. China has a clear advantage in big data because a lot of big data is collected, stored and analysed. With the average high acceptance and connectivity of mobile digital technology, the exponential growth of big data in China cannot be ignored. Not only the government support is there, but also, the market, technology and capital necessary for real big data technology innovations. Tying in with the World Economic Forum’s Industry and Business Agenda and Future Agenda, we ask about the impact of new technologies such as AI. What skills will organisations need to thrive and how can they best leverage AI to their advantage? How will AI impact business decision making? The Chinese economy — much like the daily life in many regions in China — can be characterized by one word: Change. Fast-paced, constant change. It’s been going for decades. The first generation of today’s biggest entrepreneurs started in the 70ies. They excelled in adapting their business to a growing demand. The responders. The next generation of entrepreneurs were driven by the opportunities the internet and e-commerce brought. We are talking about the BAT: Baidu, Alibaba, Tencent. The Internet leaders. What is there left to do as a startup when faced with a market that is driven by a few seemingly omnipotent players? The answer is disruption. The 3rd generation of Chinese entrepreneurs have emerged over the last 5–8 years. The Change Makers. Barely a decade after the global financial crisis, China’s economy is shedding its “factory of the world” past and embracing an innovative future built on a business ecosystem supported by rising companies such as Baidu, Alibaba, Tencent and Xiaomi and more than 1,000 new venture investments by the country’s nouveaux riches. Its ecosystem has put China on pace to become a global leader in electric and driverless cars within 10 years. It is also on track to become a leading Artificial Intelligence developer. 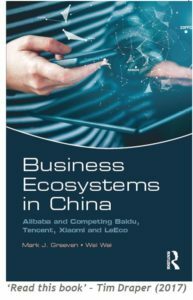 The business ecosystems of Chinese companies differ sharply from those of US juggernauts such as Google, Amazon, Facebook and Apple, according to Greeven, whose book came out in September. In the US, one company usually creates a platform which outside companies either plug into or use. In China, an outside company does not plug in, but becomes part of the business as one of hundreds of players in an ecosystem, Greeven argues.